This class has a prerequisite. Please see below. There is much to be said about the Art of Stained Glass. It is a technique of the ages; the beauty of light filtering through colored glass is awe-inspiring. In this class you will create a 12” x 12” Stained Glass window using the Copper Foil technique. You will design, choose your colors, cut glass, precisely fit, wrap your glass pieces in copper foil, and learn a style of soldering unique to Copper Foil. For centuries the technique of leaded glass was the only way to build a glass window. These windows were constructed with lead or brass, limiting the intricacy of the artist’s designs. It wasn’t until the 19th century with the creative endeavors of Louis Comfort Tiffany that the landscape of stained glass fabrication changed. As a young visionary and artist of means, he is said to have developed the technique of copper foil or at the very least perfected this innovation using it in the fabrication of his infamously intricate windows, and specifically, his stained glass lamps. 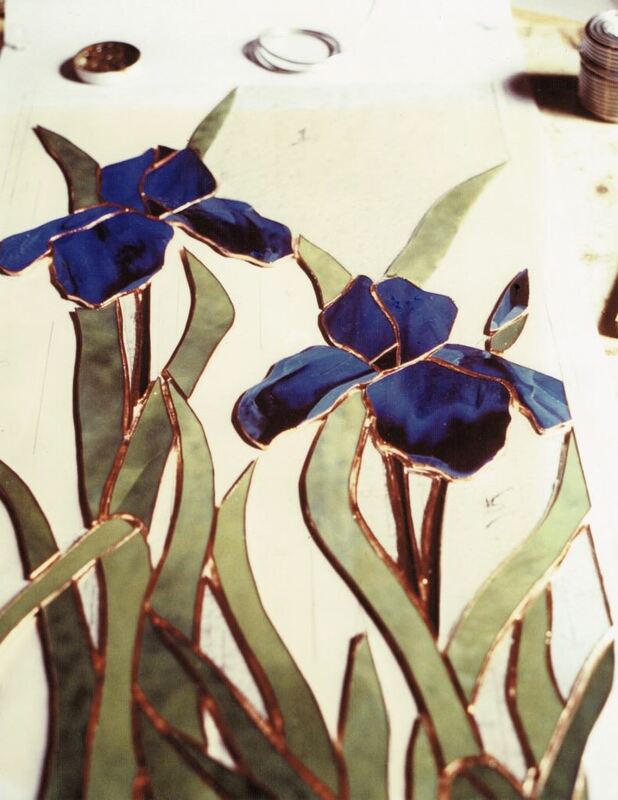 This technique allows artists to wrap small pieces of glass in a copper tape where lead would be too bulky allowing for intricate and complicated designs. This is a 5 session class held every Wednesday afternoon from NOON to 3:00 pm. Please bring ideas or sketches to class. There will be time for editing & transferring your design during our first session. Designs should have no more then forty pieces.